“Stick to the plan!” If you’ve ever stood at the in-gate you’ve heard this phrase repeated time and again. The plan is what we live by in the show ring. It’s what we live by in the barn. You’ve got to have a plan, right? This year really hasn’t gone to plan. I snapped my knee in half and had ACL surgery this spring, right as Fiona was peaking and we were gearing up for what was supposed to be our best season yet. After months of physical therapy, whining, complaining, hobbling about and otherwise trying to make lemonade out of a very lemony situation, I was back in the show ring in September on my favorite white horse. She was sparky and ridiculous in the warm-up (which is her usual when she hasn’t shown in a while), over jumping and frolicking on the backside. Big Fi was preparing for a much bigger class than the 1.10-meter one we were entered in. But after taking so much time off and only 12 weeks post-surgery, I wasn’t physically or mentally prepared for a bigger track. And of course, without fail, Fi was perfect—beyond perfect—jumping like a freaky freak and completely in sync with me. I was smiling so big my face hurt as we walked out of the ring. The happiness I felt over the last fence of that round can only be matched by the soul-crushing sadness I felt as I looked over my vet’s shoulder to see the picture on the ultrasound monitor a few days later. The day after the show I’d gotten on Fiona for a light hack and noticed that she felt off. She’s always been a bit of a soundness puzzle; she’s got some miles on her tires and we do all that we can to keep her comfortable, sound and able to do her job. But this was a different feeling and I knew she needed to be looked at. So long story short, here we are: I am finally riding sound myself and my best horse isn’t. Thanks universe. Seriously. After I stopped shouting obscenities inside my head and could communicate like an adult human again, I asked my vet how long of a recovery we were looking at. She said April was the earliest I could expect to be back in the show ring. April. Well #$@%. That wasn’t the plan. But I could start tack-walking her now. So, there’s that. I’m still not entirely sure if, during those early days, the tack-walking was more for me or for Fi. I suspect that my vet figured in my fragile mental state the walking would keep me sane and not do any harm to the horse, so best to prescribe it. And as usual, it could be worse. This is a setback for sure but not a career-ending injury. If all goes well and we give her the time and rehab she needs, she should be able to return to her former bounding, frolicking, tail-flipping glory in the show ring. Tack-walking can be a form of meditation, periodically interrupted by an unplanned capriole or other acrobatic airs above the ground. Fi is a really good patient, until she’s not, and I’m abruptly reminded that she is still the most athletic animal in my barn. I’ve found no greater motivation not to fall off than the combination of: “I just recovered from knee surgery, I cannot hit the ground” and “If I fall off, I may never catch this horse again and she will surely mangle herself running around the farm.” So sign me up for the Spanish Riding School because I’m Velcro-ed on this Lipizzaner. But when I sit down and think about it, it’s an interesting role reversal. Before I had my surgery, I would break the rules and ride. Only Fiona. She would let me mount her from the wrong side (I busted my left knee and only recently can mount from the left side), stand quietly while I got myself organized and generally cart me around like an old school horse. Athletic as she is, she is also one of the most trustworthy horses I’ve ever known. She rehabbed me. She tack-walked me from April to June and again from August to September. During that time she was kept fit and in real work by other, able-bodied riders, so there were no caprioles. She tolerated my wiggly left leg and the month when I discovered that I could walk and I could canter but trotting just wasn’t in my wheelhouse. 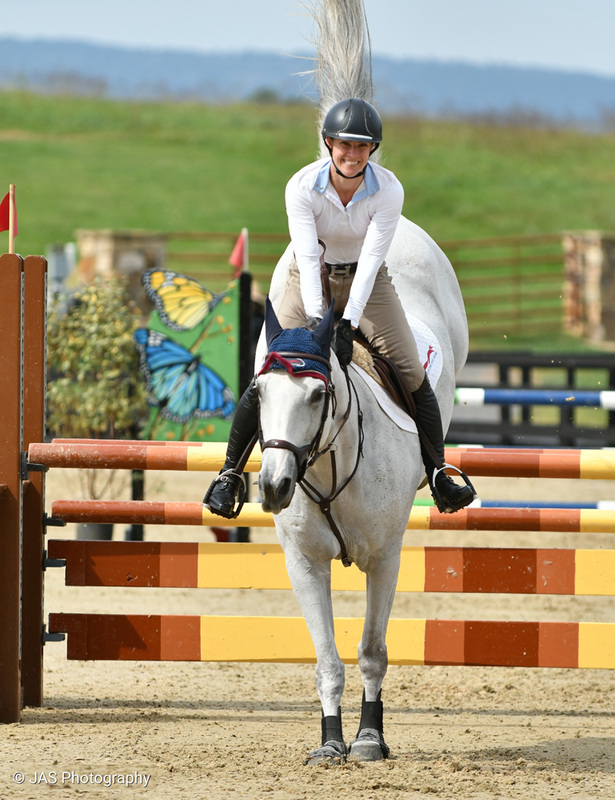 This was not the plan—Fiona, upper level show jumper, therapy horse. But deviating from the plan isn’t always a bad thing. We’ve all had trainers over the years chant the mantra, “Stick to the plan!” I say it too. But the reality of riding is that the plan has to be fluid. You’re riding a four-legged prey animal over jumps—if you don’t adapt to changing conditions, odds are good that things will end badly. Sometimes the plan has to change. A student of mine qualified for Zone 3 Finals this fall on both her children’s hunter and her low children’s jumper. 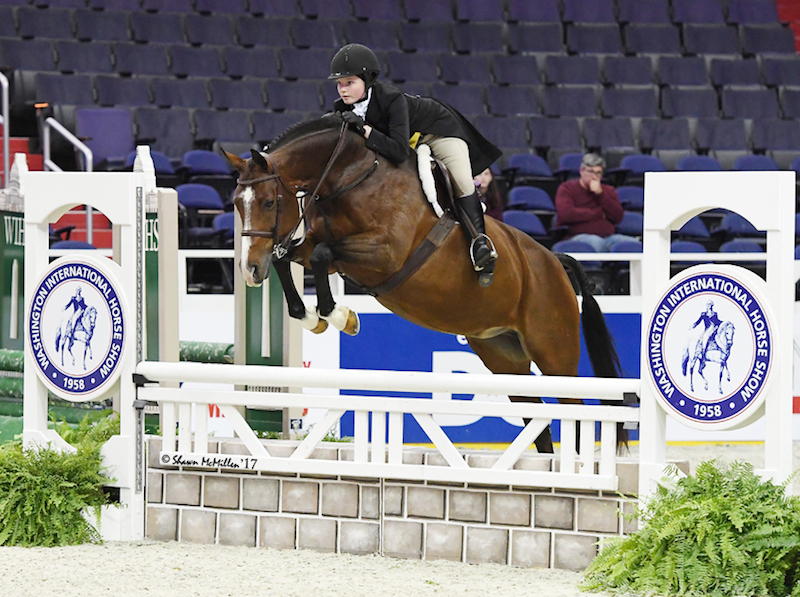 Her hunter is fairly green—it’s both the horse and rider’s first year showing at three feet. We were thrilled to qualify for Zones and were doing the Washington Regional Qualifier classes Saturday to prepare for Zone Finals on Sunday. The horse had never shown at a big indoor venue. She was backed off and over-jumping the day before in the 3’ green hunters. I expected stage fright. Maybe a spook. But wouldn’t you know, the kid knocked it out of the park, the horse was fabulous and they placed well over fences. 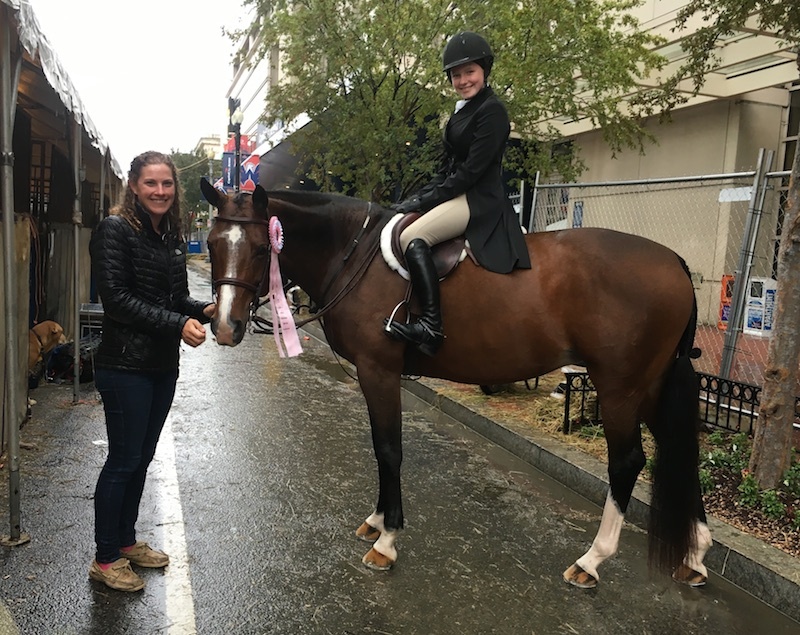 And as we were checking out on Sunday, Kelsey and Sambalina got their invitation to compete in the Regional Hunter Finals at WIHS. This was not the plan. It was such a long shot that she would qualify that I’d planned to leave for a vacation on the Sunday that she would show in Washington. Sometimes plans change. And we made a plan. We trained at home for the next week and headed downtown for a sleepless night where Lexi and I prepared Samba as best we could and I chewed off all my fingernails. Over-tired and wired on bad coffee from the world’s sketchiest McDonalds the next day, I can honestly say I have never been more proud of my team, a horse and a rider in all my life. They were about as close to perfect as they could be and took home fifth place. I’m still relatively new to the game, I haven’t been out on my own for that long and just to be there showing was a huge accomplishment for all of us. When I stop and think about the year—best laid plans gone awry, some dreams dashed and others realized—I can’t help but feel a sense of gratitude. For even at my lamest and arguably lowest point in my personal riding career, my business flourished, my customers are riding well, we’ve sold horses, and things are generally going in the right direction. The plan is part of it, but it’s the people who make it all possible. 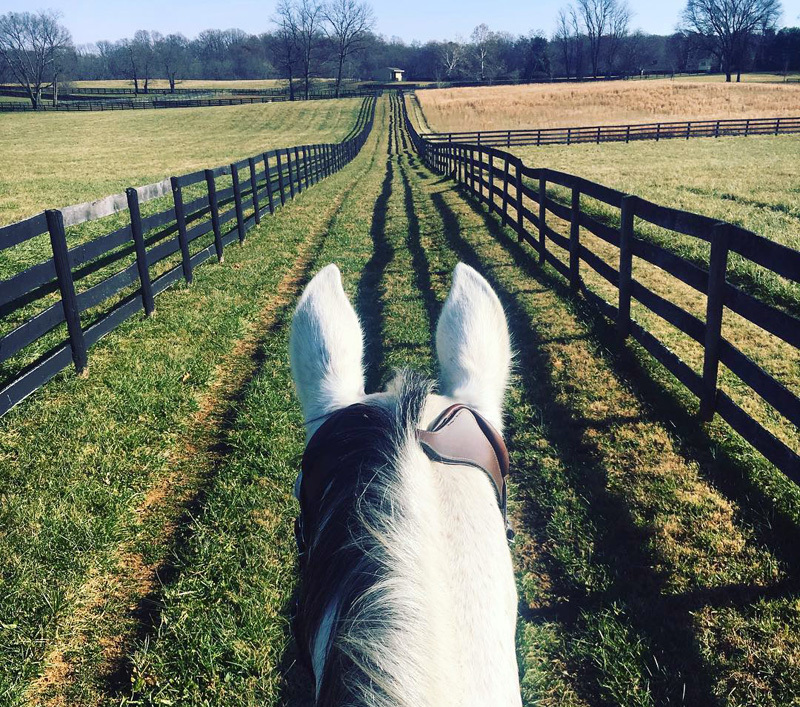 Chronicle blogger and up-and-coming hunter/jumper trainer Paige Cade spent most of the 2015 FTI Winter Equestrian Festival working for Margie Engle’s Gladewinds Farm, and in 2015 made the decision to return to Virginia to start her own riding and training business, Country Fox Farm, Inc., in Middleburg. Paige would like to thank Antares, Purina, Dr. Sallie Hyman and Total Equine Veterinary Associates for their continued support.